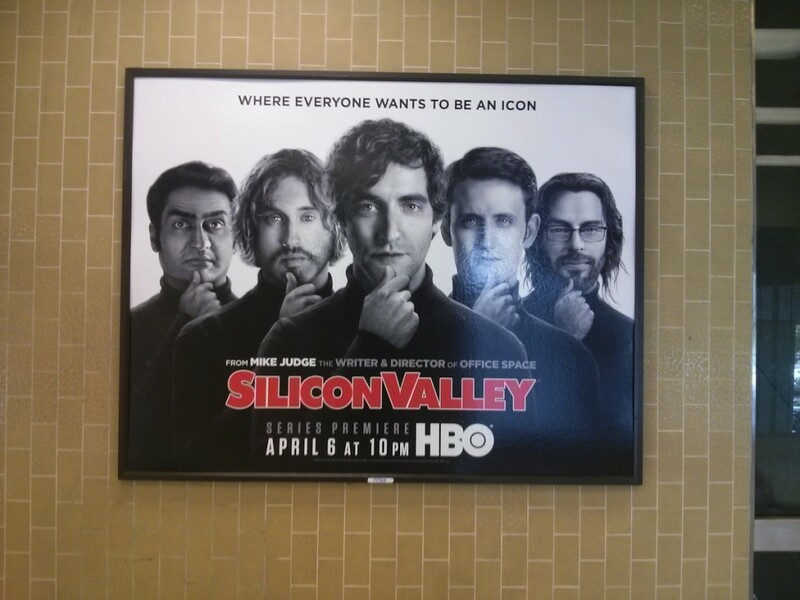 Posted byParker Higgins	 4 April, 2014 4 April, 2014 1 Comment on Silicon Valley ad tribute to Steve Jobs: fair use? In case you’re not familiar with the original, this is a straightforward parody of Albert M. Watson’s famous portrait of Steve Jobs, which appeared on the cover of Jobs’s biography and the memorial Apple homepage after his death. Maybe I had copyright on the brain more than usual, but the ad immediately brought to mind the case Leibovitz v. Paramount. 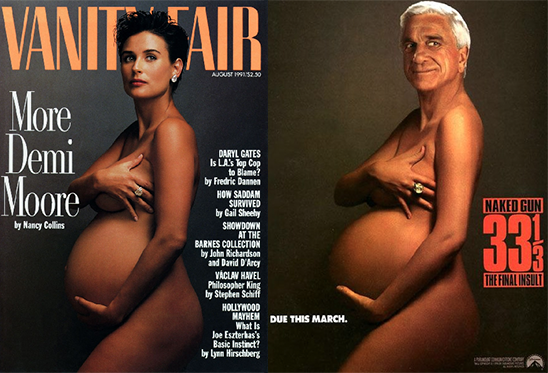 That case was over whether an advertisement for a Naked Gun movie (below, right)—a parody of an Annie Leibovitz portrait of Demi Moore on the cover of Vanity Fair (below, left)—was a fair use. 1Side note: I don’t remember this magazine cover or movie ad firsthand, but what staying power must the photo have had to be the recognizable target of a parody two years later! Is there any magazine cover in the past decade that is so iconic? The Second Circuit ruled that yes, the use was fair. The case has become quite influential; along with Campbell v. Acuff-Rose in 1994, it’s one of the clearest citations for the fact that commercial use does not preclude a finding of fair use. So back to Silicon Valley. The parallels between the two cases should be clear: an advertisement as a parody of an iconic photograph, recreated by a new photographer, but with a more-than-substantial similarity to the original. In fact, not much distinguishes the two cases. I’d expect a copyright claim from Watson to fail, especially if brought in the Second Circuit. Interestingly, Watson has litigated over the photograph. Almost exactly a year ago, he brought a suit against artist Alex Guofeng Cao and a partner David Datuna for creating “high art” derivative works of the photograph. One, “Steve Jobs vs Neil Armstrong, After Watson,” was part of a gallery show; the other, “Steve Jobs-Ayn Rand,” sold to a collector for over $200,000. A work’s status as fine art seems sometimes (but not always!) to weigh in favor of a finding of fair use. The Second Circuit ruled mostly in favor of appropriation artist Richard Prince in a major fair use case last year, for example—a ruling that came down just days before Watson filed suit. We won’t know how that factor would have affected the decision in this case, though, because the parties apparently settled last month—March 6. It’s possible, too, that Silicon Valley has a license with Watson. It’s a hard thing to find out because there doesn’t have to be any public record of the license. That’s one reason why policing copyright on user-generated platforms is much more complex than some copyright maximalists like to make out: it can be impossible to distinguish a lawfully licensed work from an infringing one, and even more complex if fair use is a factor. Even if the use of the photograph is a definite fair use or licensed, there’s another interesting possible legal obstacle. (I’m not a lawyer, and we’re out on the fringes here, so take this with a grain of salt.) It seems possible that the estate of Steve Jobs could claim the ad infringes his right of publicity. Such a claim in the Ninth Circuit could lean on White v. Samsung, where a majority held that a robot shown in a Samsung ad was too similar to Vanna White. Judge Kozinski’s dissent in this case is an all-time great. But doesn’t the group of Silicon Valley guys wearing the famous Jobs turtleneck and in his thoughtful pose evoke Jobs’s image just as much as the Samsung robot evokes White’s? In any case, I agree much more with Kozinski’s dissent than the holding in the case. I hope we don’t see such a challenge. 1. ↑ Side note: I don’t remember this magazine cover or movie ad firsthand, but what staying power must the photo have had to be the recognizable target of a parody two years later! Is there any magazine cover in the past decade that is so iconic?